Emily Roberts is a staff attorney and Ohio Legal Assistance Foundation Justice For All Fellow. 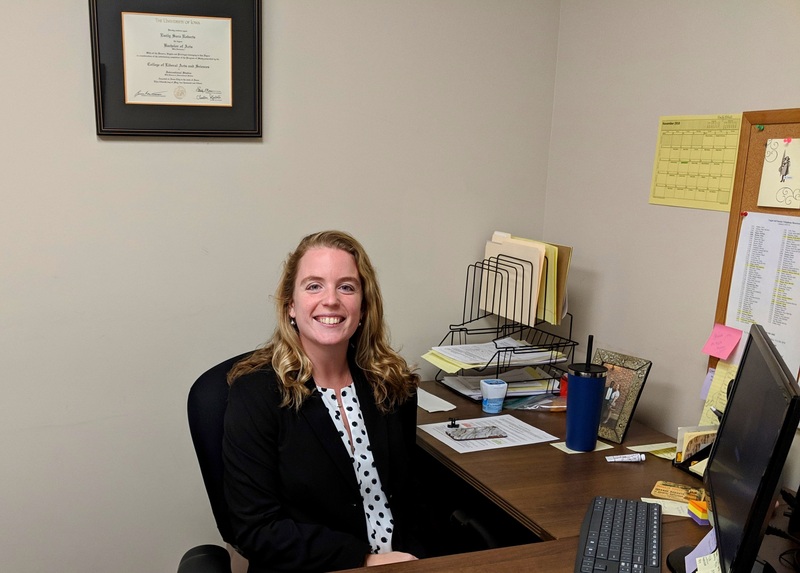 Her two-year fellowship project focuses on the connections between domestic violence and loss of housing and creating a strong local referral mechanism between Legal Aid, social-service organizations, homeless shelters, and housing agencies. Q. Where are you from? Where did you go to school? I am originally from Chicago. I received my B.A. in International Studies from the University of Iowa and my J.D. from the University of Cincinnati College of Law. After my first year in law school, I interned at the Legal Resources Centre in Durban, South Africa, where I realized my passion for housing work. After my second year, I interned at Legal Aid in the Hamilton office and I really enjoyed my time there. Q. Why did you want to become an attorney? When I was studying International Studies in college, I learned I had a passion for human rights work, and I thought getting a law degree would be the best way for me to help people. Also, both my parents and siblings are attorneys which definitely had an impact on my career choice. Q. What about public interest law most excites you? I really enjoy the ability to work within the community and facilitate other local organizations to work together to combat larger issues. Q. What is the focus of your Fellowship project? The focus of my fellowship is looking at the affordable housing gap in Cincinnati and how that is having an impact on the city’s high child poverty rate. Because of my interest in domestic violence work, a key part of my fellowship is looking at the unique impact the lack of affordable housing and poverty have on survivors of domestic violence and their children. Whenever there is a client who comes to Legal Aid with both housing and domestic violence issues, they are referred to me. My goal is to create a better referral mechanism between social service agencies, homeless shelters, housing agencies, and Legal Aid so that we are able to stop housing crisis issues or further incidents of domestic violence, rather than acting to remedy the negative effects after the fact. Q. What have you discovered about the actual practice of law that you didn’t know? It’s difficult to balance friend vs. attorney with my clients, because so many of them are struggling and I want to be there for them. They also sometimes put me on a pedestal, thinking that I can solve everything and it’s been difficult to give my clients bad news if I can’t help them with certain issues. I was recently successful in getting a client transferred out of her housing due to domestic violence. Many landlords are unaware of the Violence Against Women Act (VAWA) and that victims are allowed to terminate their lease if they have been a victim of domestic violence, and their abuser is still listed on their lease as a household member. It’s been a challenge educating landlords about this process, but I’m happy to see more clients being referred to Legal Aid who want help filling out and submitting a housing transfer under VAWA. Q. What are your hobbies and interests? How do you relax/unwind? I like to do yoga to relax. I did it almost every day while I was in law school and it really helped me de-stress. I also love to snowboard. My parents have a home in Jackson Hole, Wyoming and during the Christmas holiday, I go visit them and snowboard as much as I can. Q. What volunteer activities are you involved in locally? My boyfriend is the founder of a non-profit called The Conscious Connect which is dedicated to school-age and neighborhood literacy. I’ve helped the organization set up mini libraries in book deserts so children in the area have access to a wide array of books, especially some that are culturally appropriate. Q. What part of Greater Cincinnati do you live in? Why? When I moved to Cincinnati for law school, I decided to live in Camp Washington due to its closeness to school but also far enough away that I wasn’t in the college town. Now that I am working at Legal Aid, it’s interesting to see that living on the “West Side” of town means I live pretty close to where some of my housing clients live. Q: What has surprised you most about your time at LAS? I’m most surprised about how often I’m not in the office. I’m traveling a lot to other counties for meetings with clients, or I’m in court. I’ve already come to cherish the days where I can sit in my office and catch up on work.